An expert in dog law has welcomed calls for a review of dangerous dog laws, telling Julia Hartley-Brewer "you can't assume a dog is dangerous just because of its shape". Trevor Cooper, a dog law consultant at Battersea Dogs and Cats Home said current rules around dangerous dogs were "bizarre". "It's called the dangerous dogs act yet for a dog to be regarded as dangerous, it doesn't actually have to pose a danger, it's bizarre," Mr Cooper said. A number of MPs have called for a review of laws introduced in 1991 which outlaws certain breeds of dog to protect the public from attack. 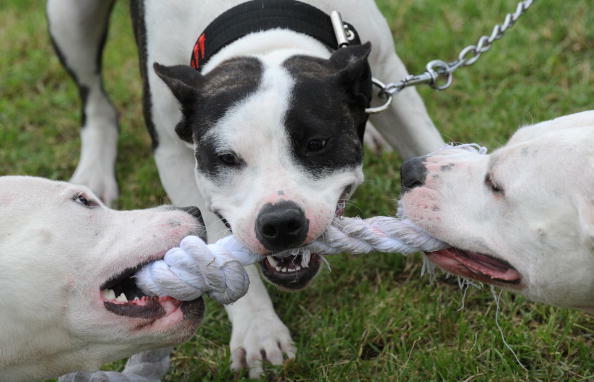 Despite the laws, hospital admissions for dog attacks have increased 81 per cent since 2005. The Environment, Food and Rural Affairs (Efra) Committee have released a report calling for an independent review into the reasons for dog attacks and aggression, including whether banned breeds pose an inherently greater threat. Committee chairman, Neil Parish, said that putting a harmless dog down due to its breed alone was "cruel and illogical". Mr Cooper said he "completely agreed" with the Committee. "If a dog of the wrong shape comes into Battersea, regardless of how friendly that dog is, we're given no choice under this law other than to put it down," he said. "If we're going to condemn breeds lets have the evidence to prove that those are the dogs that pose a danger. You can't assume a dog is dangerous just because of its breeding." There are four types of dog that are currently illegal in the UK: the Pit Bull Terrier, Japanese Tosa, Dogo Argentino and the Fila Brasileiro. There are instances where cross breeds can be categorised into these four groups, depending on their size and characteristics. Mr Cooper explained that in some cases, banned breeds can avoid destruction and be kept by their owners. "If a dog is owned by a member of the public then a court can allow that dog to be exempted, so there are ways in which the dog can be lawfully retained at home provided the dog wouldn't constitute a danger to public safety. "There's over 3,500 dogs, Pit Bull Terrier types, that have been allowed to be registered. So in over 3,500 situations, the court has been satisfied that the dog isn't in fact, dangerous."